Your eyes will light up as you feast them on the glittering gold reels on popular slot online, 88 Fortunes. The gold is almost hypnotising and will certainly entice you to play as you see the glistening 9th-century cast cash coins flooding the reels. It’s not just the cash coins that are golden however, you will also see a golden turtle, a golden ancient warship, a golden gong, golden bird and golden fountain. You will be immersed in riches and feel like Asian royalty in this game and will be greeted by the two mascots of the game, two Asian cartoon characters with welcoming, cheeky grins. 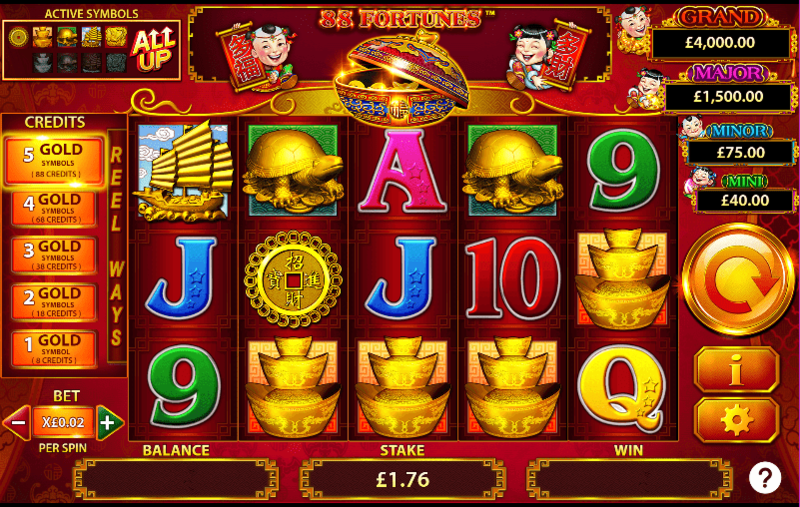 88 Fortunes slot game comprises 5 reels and over 240 ways to win which is certainly nothing to be sniffed at! There are plenty of fortunes to be made and surprises to be uncovered in this oriental inspired slot game which will leave you grinning from ear to ear, all available at Wizard. One of the most exciting features of the game is the Fu Bat Jackpot which, as the name suggests, help you win a generous jackpot to shout about! The key to winning the lucrative jackpot is to land a Fu Bat symbol on the reels, once you do this you will see a 4 x 3 window with golden coins. Once you see this, click on a coin to unveil its hidden symbol. If you’re lucky you will get three of the same symbol and be the owner of a pretty handsome jackpot. This is only one of the many reasons players consider this as among the top online slot games of today! 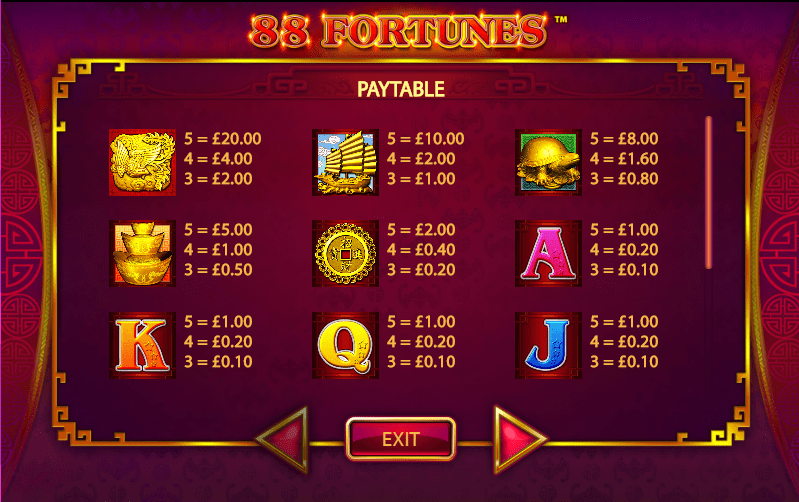 Everyone loves a freebie, and Fortune 88 is full of opportunities to bag yourself a lucky freebie. The golden gong symbol is your key to unlocking the free bonus games in Fortune 88, so keep your eyes peeled for them. If you land 3 of the symbols on the reels in a consecutive order you will be gifted with a free game. The free games feature only the higher paying symbols, omitting the common symbols such as the playing card symbols, giving you a bigger opportunity to win huge prizes. As well as the fantastic features of this game the visuals are incredible, so it’s a good job there is a handy autoplay button which will allow you to sit back, relax and watch the glittering golden reels spin round and do all the hard work for you, while you reap the rewards! What are you waiting for? Get your bags packed and head on a trip to Asian for an oriental adventure with Fortune 88, just make sure you have some room left in your suitcase for your trip home, as those gold coins can get pretty heavy! Or try and win some gold coins by becoming a gladiator in Spartacus.